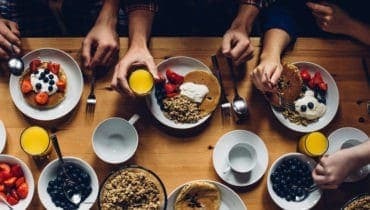 Why Is Food Important In Your Small Group? Think of a time when you were hungry. How did you feel? What was your state of mind during that time? Why are we told it is a bad idea to go grocery shopping when we are hungry? Hunger can affect how we feel, what we do, and even the decisions we make. Isaac and Rebekah had twins, Esau and Jacob. Esau was a mighty hunter. He loved being in the outdoors. His twin brother was the opposite. Jacob was happier staying at home and doing tasks like cooking. One day Esau came home from being out on one of his outdoor excursions. He was extremely hungry. This probably meant he wasn’t successful hunting this time out. At the same time, Jacob had a pot of lentil stew ready to eat. The aroma filled the air. In his moment of hunger, Esau sold his birthright to Jacob for some of the stew. That was an expensive bowl of stew! Are you currently gathering with your members without the aid of food? I don’t believe it was a coincidence that Jesus taught and performed miracles in many situations that involved food. Showing up to a small group for the first time can be a scary experience. You can help reduce those fears by including food. It creates an inviting focal point that draws a person’s attention. Food allows attendees to immediately participate in a safe way when it is incorporated at the beginning of your gathering. It even provides a natural topic of conversation that all participants have in common. There is no better way to encourage personal conversations to take place than to have food in the room. There is something about the act of eating food that brings down barriers and puts people at ease. Esau gave up his birthright because he was hungry. Food has an impact on our ability to make wise decisions. I wonder if Esau regretted his choice as soon as he ate the food. Even the wisest people won’t make good choices when they’re not rested and their glucose is low,’ Baumeister points out.” John Tierney in Do You Suffer from Decision Fatigue? We want our members to be at their best when discussing, learning and making decisions that can change our lives and the lives of those around us. Some of our members may not have eaten for several hours. Simply providing food at your gatherings can make a significant difference. The group should decide whether they want to have a meal around a table or mingle while eating snacks. Obviously, the meal will be more substantial, but it could be the best choice due to the meeting time and member situations. Whether providing meals or snacks, try to include something that everyone can take part. If possible provide at least a couple of eating options. Have people name their food allergies if they are comfortable letting the group know. You may not be able to please everyone every time, but members should not feel excluded either. It is usually best to rotate the responsibility for providing food. The cost of food can be significant if it is on the shoulders of only a few. This problem is eliminated by rotating the responsibility. One person should be identified to organize. This would include signing up people for specific gatherings and reminding them when it is their turn. It can also include ensuring there is a backup plan if the unexpected happens. Small group food should be viewed as one spiritual tool that makes up hospitality. It should not be viewed as a source of competition. If comparisons start to be made between what one member provides vs. another, it can become a problem between members. It doesn’t matter who bought food items instead of cooking them, who provides the most elaborate setting, or who is the best cook. What matters is the nutrition and enjoyment that comes from all of it, that ultimately results in stronger relationships and significantly changed lives. 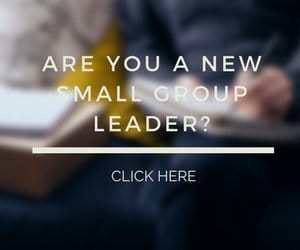 Question: How has food helped in your small group? What tips do you have for incorporating small group food into your gathering? You can leave a comment by clicking here. 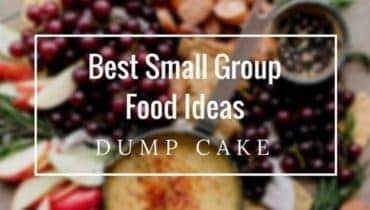 Best Food Ideas for a Small Group?